Ready for spring to arrive? So is your garden. 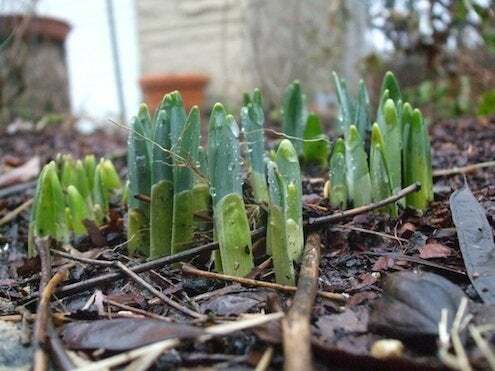 The ground may still be cold, but longer days have already begun to coax your plants out of their winter dormancy. It’s undoubtedly early—there’s not a lot of true gardening to do yet—but there are several valuable ways that you can prepare for the busy spring and summer seasons ahead. Check your garden for winter damage. Shake off any snow that remains on delicate branches, and clean up any boughs that were broken in storms. Add mulch to areas where your fall application has thinned, and replant any shrubs that were pushed up by frost heave. As you work, try not to walk on muddy areas, as your footsteps will compact the soil. Here’s a fair-weather gardening instruction that is also relevant during the cool weeks of late winter and early spring: On sunny days, give your flower beds a good soaking—warm fronts are on the horizon, after all. With newly sharpened garden tools, prune all dead or diseased branches, not to mention branches whose appearance contrasts with the prevailing aesthetic of your shrub or tree. Avoid cutting any species that bloom early, such as lilacs or azaleas. Compared to plants growing outdoors, your houseplants will return more quickly. Help their growth by dosing your regular spring fertilizer at half strength. Not everything needs a head start, but if you’re itching to get back into the garden, why not experiment with early- and slow-growers like peas, lettuce, carrots and leeks? Now is also the time sit down with a seed catalogue to select and buy all of the varieties you wish to try this year.